Registration is now closed for the 2018-19 cohort. Are you a farmer or gardener interested in exploring the deeper aspects of the work you are doing? Biodynamics offers a unique way to live positively on the earth with our fellow soil, plant, and animal companions. In this six-month interactive course, we will develop a deeper understanding of biodynamics through intensive study of Rudolf Steiner's Agriculture, the 1924 series of lectures that founded the worldwide biodynamic movement. Led by renowned biodynamic farmer and educator Cory Eichman of Saugeen River CSA, this is a unique opportunity to deeply explore biodynamics in a distance learning format. This is the fourth year the course is being offered through the Biodynamic Association after many years as an on-farm course in Ontario. The farm individuality is the central image in biodynamics, and developing an understanding of how you can work with a piece of land to manifest this individuality is a central task as a farmer or gardener. We will explore how we can encourage the life processes to enhance the health and vitality of our soil, plants, and animals. This in-depth course will provide you with a firm foundation in Rudolf Steiner's spiritual science as it informs our day-to-day practical activities on the farm or garden. Your observational abilities will be enhanced to help you develop a relationship to the cosmic and earthly activities going on around us. We will thoroughly explore Steiner's eight Agriculture Lectures, which provide the foundations for biodynamics. His book Theosophy will also be read as background for understanding some of the deeper aspects of the biodynamic preparations, composting, soil science, botany, crop management, animal husbandry, planetary influences in nature, and the role of food and nutrition, among many other topics. The Individuality of the Farm is open to anyone with some experience farming or gardening. A certificate of completion will be available, for more details on certificate requirements email Kaitlin at kaitlin@biodynamics.com. Download the 2018-19 course synopsis and schedule. In addition to the weekly class sessions, there will also be a monthly lunchtime discussion session for participants to discuss questions and reflections with each other and Cory. This course is limited to 60 participants to foster a close learning community. To ensure continuity and a high-quality educational experience, participants are asked to commit to the full six months and late registrations will not be accepted. Both books are available from Steiner Books at www.steinerbooks.org or 703-661-1594. Steiner, Rudolf. Agriculture: Spiritual Foundations for Renewal of Agriculture. Biodynamic Association, 1993. Steiner, Rudolf. Theosophy: An introduction to the spiritual processes in human life and in the cosmos. SteinerBooks, 1994. Registration for the 2018-19 cohort is now closed. The first session took place on September 24, and a recording is available for late registrants. Registration for the course is $400 for the general public. $360 for Soil Builder Members, $320 for Seed Sower and above members. Join to get the discount automatically! Partial scholarships are available through the Biodynamic Scholarship Fund. "The Individuality of The Farm online course, by Cory Eichman, was a wonderful way to add consistency to my biodynamic studies. As a full time apprentice working to feed 200 CSA members a week, I sometimes get caught up in my practical work and daily life and have little time to sit down and dive into the higher purpose of what I am really doing and learning. This course broadened my sense of the different aspects of the farm individuality and gave me so many new insights into the different life processes of soil, plants, animals and everything and one involved with the farm. What I really enjoyed most though was the conversations these classes ignited with my fellow apprentices. Thank you Cory and The BDA! "The Individuality of the Farm course was a very beneficial experience for me, in terms of both furthering my own spiritual development as well as deepening my understanding of the foundational biodynamic principles. Cory is obviously a seasoned biodynamic practitioner, as well as a very articulate and thoughtful teacher. He built the concepts of the course in such a way that the last few classes tied many concepts together that were introduced throughout the course. One perception that really resonated with me involves the analogy of the soil as the soul of the farm individuality. Cory explained that the soil acts as a bridge from the cosmos to the earth, much like a human's soul acts a a bridge from the spiritual to the physical. This simple comparison has fostered deep contemplation and meditation for me and has greatly expanded my understanding of our farm. Not only did The Farm Individuality course provide knowledge, but it also offered a sense of community. It felt empowering to be in class and in community with other biodynamic farmers, aspiring farmers and gardeners. Our family lives and farms in a part of Western NC, where there are many organic and sustainable farms but no practicing biodynamic farms within a 2 hour drive. A biodynamic practice is one that is always growing and developing, which is challenging in isolation. The small group and one-on-one discussion provided opportunities to fostered and develop this sense of community." Cory Eichman has been farming in the context of biodynamic CSAs for over 20 years, beginning with an apprenticeship in 1992. In 1997, he founded Saugeen River CSA, an 80-acre draft-horse-powered biodynamic farm in Durham, Ontario. Cory has been active in the Ontario Biodynamic Society since 1998, and on the board for 6 years. He was also on the board of Demeter Canada for 6 years. 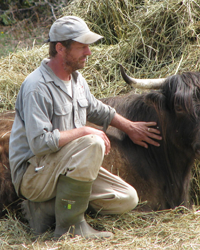 Cory has mentored apprentices since 1998, and has been teaching introductory and advanced Biodynamic courses through the Rudolf Steiner Centre Toronto and independently since 2005. He helped to found the North American Biodynamic Apprenticeship Program beginning in 2006, and continues to be a member of the steering committee.